The most popular custom aftermarket firmware CyanogenMod is seeing a big update today. In an post published over on their official blog, the CyanogenMod team has released the first Release Candidate (RC) of CyanogenMod 7.2. CyanogenMod 7.2 adds a handful of new features such as support for notable new devices (Galaxy Ace/Mini/Epic, Optimus Black/3D/Hub/Pro/Sol/One, Motorola Atrix, Sony Ericsson Xperia Live/Pro/Active and Huawei U8150), support for OMAP3/4 devices, a T9 predictive Phone dialer, ICS transition animations and updated translations to name a few things. If you wish to install it, check out our step by step guide after the break! DISCLAIMER: Redmond Pie is not to be held responsible for any loss of data as a result of the malfunctioning of your smartphone/tablet in the following of this guide. Step 1: Download the ZIP of CyanogenMod 7.2 RC1 from here (link removed as it’s broken since CynogenMod as a company is no longer active). Each of the 69 supported devices has a separate ZIP, so be sure to confirm your device’s name first and then download the right file. Flashing the wrong file can have disastrous consequences. Step 2: Transfer the ZIP to directly under /sdcard on your device. Step 3: Turn off your device. Step 4: Now, by pressing and holding a specific combination of buttons, you must boot into ClockworkMod (CWM) Recovery. This combination is different for different devices, so search for your device’s combination on Google. Step 5: After entering CWM, take a nandroid backup. This will come handy later on if you wish to revert to your earlier set-up. Step 6: From main menu, select wipe data / factory reset. This will wipe all personal data from your device. Similarly, select wipe cache and wipe Dalvik cache from under advanced menu. Step 7: From main menu, navigate to install zip from sdcard > choose zip from sdcard and select the file you transferred to /sdcard in Step 1. Step 8: After flashing, simply select reboot system now from main menu. 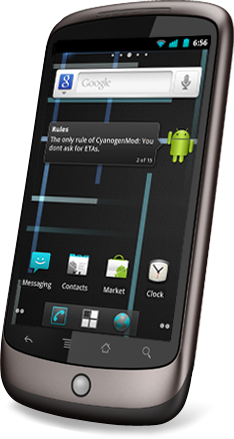 If you follow the steps properly, your device will now boot into CyanogenMod 7.2 RC1 based on Android 2.3.7 Gingerbread.